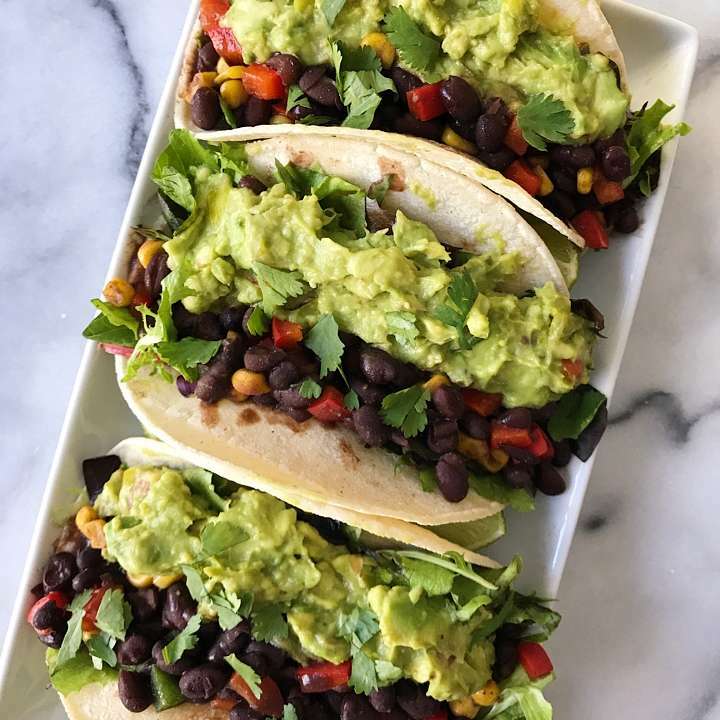 An easy 30 minute Vegetarian dinner any night of the week, but especially on Taco Tuesday! It’s Taco Tuesday time again! By now you know we love Taco Tuesday! Tacos are adaptable to tastes, nourishing, delicious and so satisfying! The perfect quick and easy meal! 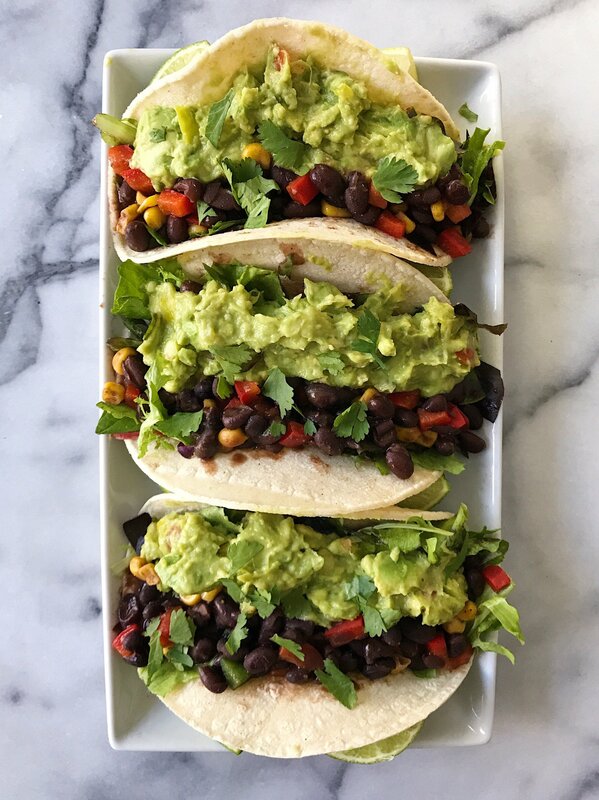 These Black Bean and Guacamole Tacos are one of our favorites. 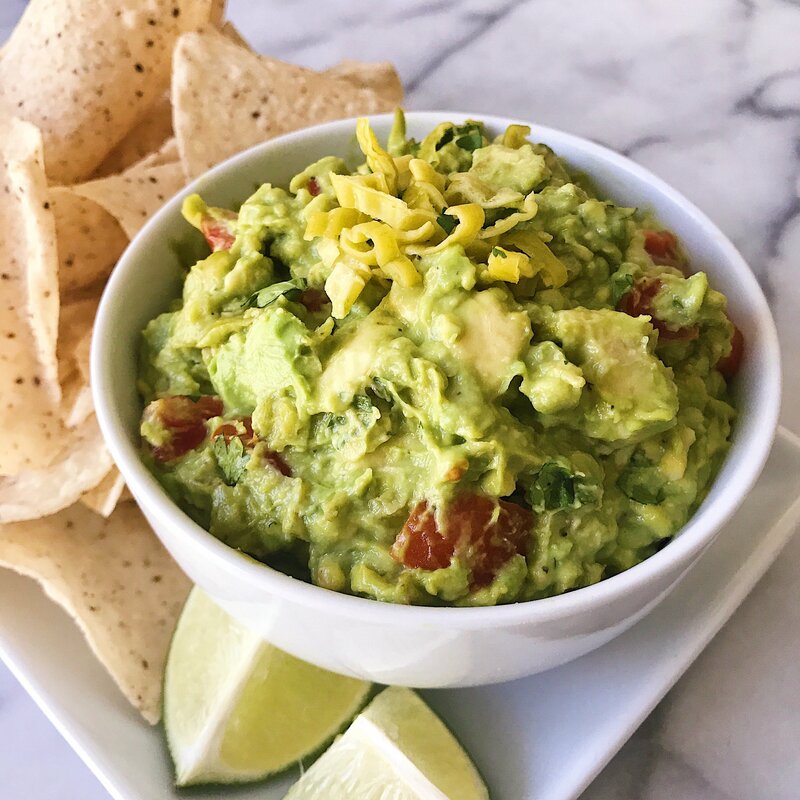 It’s an easy 30 minute meal that’s always a crowd pleaser… you can’t go wrong when guacamole is involved right? Recipe inspired by Soup Addict, I took the Quick Simmered Beans we loved from Minimalist Baker and added red pepper, corn, and a little jalapeño. Then paired it with our Favorite Guacamole,in a soft corn taco (we used Mission Brand) with some lettuce. That’s it! Savory, warm and cozy. And couldn’t be easier or yummier! All you need…. 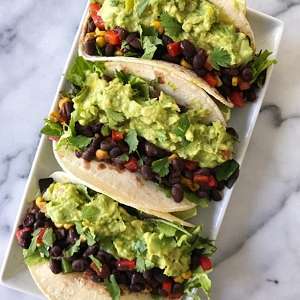 canned black beans, red pepper, canned or frozen corn, jalapeno, plus yummy spices — salt, cumin and chili powder to make the quick simmer black beans. 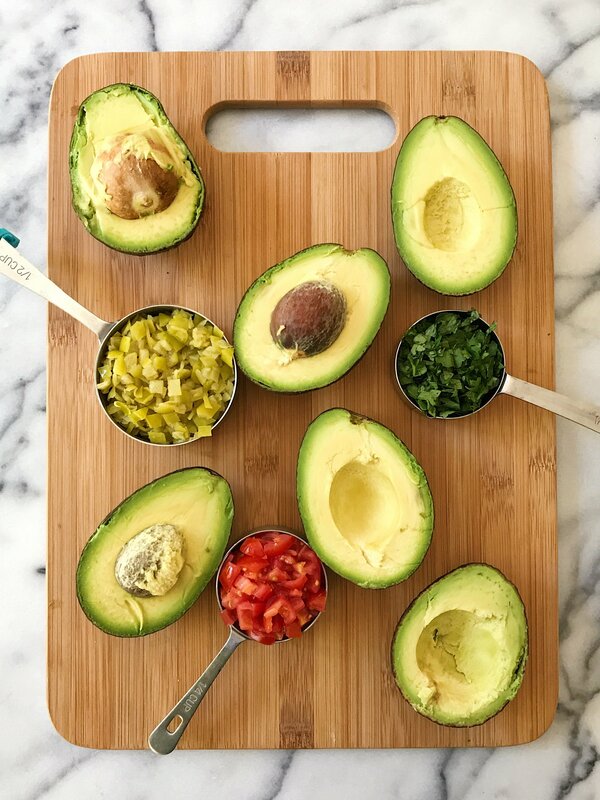 Add in some guacamole (you could use already prepared but we highly recommend making our simple one below), gluten-free flour tortillas, and some cilantro for topping. Next up… homemade guacamole! There are so many variations of guacamole and we’ve tried many versions…. and quite honestly, I’ve never met a guacamole I didn’t like. BUT…. a friend introduced us to this one with her secret ingredient and we’ve been hooked ever since! What you need…. avocados, cherry tomatoes, cilantro, salt, pepper and jarred Banana Peppers! Yes, that is the secret ingredient that changes everything! It add the best tangy flavor (in place of lemon or lime) and as I bonus it helps keep the guacamole fresh and from turning color quickly. So go ahead and give it a try and let me know what you think! The boys actually like this meal because of the guacamole! They prefer their tacos with less guacamole on the actual taco and more served on the side with chips…. and they also like to add chicken. No matter how you assemble it, this dinner is always a hit! A quick and easy gluten-free and vegetarian meal. 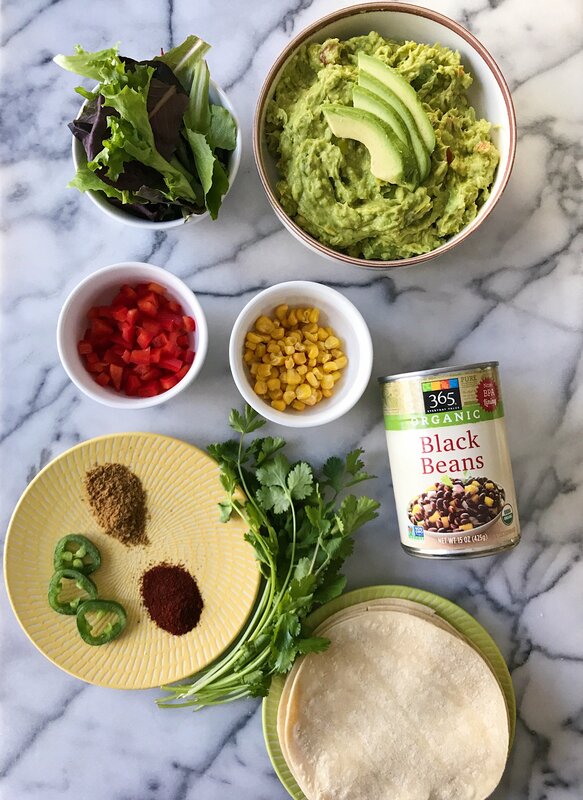 Savory and delicious, these tacos are loaded with black beans, peppers, corn and our favorite guacamole. Add beans including liquid to a small saucepan over medium heat. Stir in spices and bring to a simmer. Let cook for 10. Add red pepper, corn, and jalapeño if using. Simmer an additional 5 minutes, longer if you want your veggies softer. Warm tortillas in a microwave by placing on a plate and losely covering with a slightly damp paper towel. This will help make sure the tortillas don't crack and give a better texture. In each tortilla place some lettuce. Using a slotted spoon to spoon out the black beans, top the lettuce with the black bean mixture, then top with guacamole. Garnish with cilantro.